What Do You Drive To The 24 Hours Of LeMons? You'd figure the folks who like to race disintegrating $500 clunkers would drive some decent machinery, and you'd be right! UDMan found some Jalopworthy steel parked around the pits: Since this is a race of $500 race cars, it is quite interesting to see some of the cars sprinkled throughout the pits. 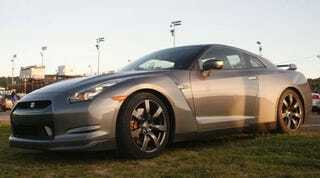 What’s this, a brand new GT-R, dressed in this years most popular color, Gray. Oh, and look at that beautiful white 911, an edition I’m unfamiliar with, A BMW 6 Series (with a 5 series M stable mate), an Evolution, and a Mazdaspeed 3? Well, the last two seem to be the Jalopnik staple of cars almost everyone would like to own, so why not. Feast your eyes.